There is one day in Joan Child’s life that she wishes she could do over: the day her daughter Pam, a brilliant psychotherapist, plunged from a fifteen-story building to her death. 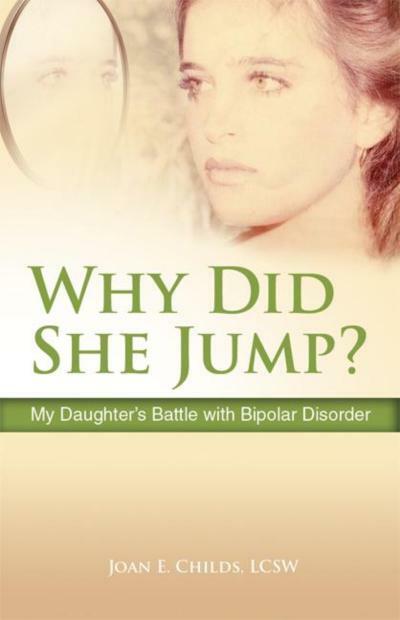 But despite the coroner’s report of a suicide, Childs explains why her daughter’s life was taken by the most unforgiving of executioners: bipolar disorder. It was the delusions, not her daughter, who made the final decision. Why Did She Jump? is an intimate, uncompromising delve into one mother’s search for peace amid the chaos surrounding her daughter’s tragic death, and a masterful recounting of the events leading up to the fateful day, lifting the veil of shame and secrecy to forge a path to understand bipolar disorder and other mental illnesses. Ironically, both Pam and Joan were noted psychotherapists, and yet, even with their credentials and medical knowledge, Pam still could not be saved. In heartrending prose, Joan recounts the vivid memories of Pam’s life—the extreme highs and lows; the many red flags that were missed by well-meaning parents and overburdened medical systems; how her daughter toggled both worlds as a brilliant therapist who healed unreachable patients as she was unraveling herself; and how she fooled everyone into thinking she was stable. Joan E. Childs has been a licensed clinical social worker since 1978 specializing in change work for human potentiality, personal growth and self actualization. She was chosen to be the first affiliate of the John Bradshaw Center in the United States and is a consultant to many corporations, hospitals, universities and academic institutions. As a resource program presenter specializing in women’s issues, couple and family relationships and personal effectiveness, she has appeared on many radio and television shows and before live audiences. She is the author of The Myth of the Maiden: On Being A Woman which was published by Health Communications and released in July, 1995. Ms. Childs is a Certified Hypnotherapist, EMDR (eye-movement and desensitization processing) specialist, Master level Neuro-linguistic Programmer, Diplomat of Clinical Social Work and Pairs Leader. Losing your child is a terrible tragedy. Having your daughter choose to take their own life is even worse. Imagine then, if you are a trained psychotherapist and your daughter too is one – and yet you and she are unable to stem the tide of bipolar disorder that takes hold of your daughter’s mind. Eventually, the author’s daughter, Pam took her own life, unable to find her way out of the clutches of this dark mental illness. Tragic, doesn’t begin to describe this. I marvel at the way Joan Childs channelised her pain to share her journey of healing with the world. Her honesty and insight comes through as she reveals how she coped with Pam’s death both as a mother and a professional. Not allowing the terrible grief that threatened to consume her and her family, the author found a way to forgive herself and her daughter. This brought healing to the family and finally, she was able to let go. This book will makes for a cathartic read for all who have lost someone so tragically. I received this book from the published via NetGalley in exchange for an honest review. Pam’s struggle with her demons had been going on much longer than any of her family, friends, or coworkers realized. Fearing we would make judgments, she suffered mostly in silence because she knew that we would have difficulty accepting and understanding her belief system. As a trained clinical psychologist, Pam knew how preposterous her belief system sounded to others, not unlike some psychotic patients she treated and often referred to psychiatrists for medication. When she did share her thoughts and beliefs with us, all we could do was try to reason with her, hoping to bring her back to her senses by alleviating her fears. We tried to be sympathetic and supportive, but none of us could fight the demonic force that resided in her mind, dictating the course of her events. Nor could her psychiatrists, numerous psychologists, colleagues, friends, rabbis, priests (both Christian and Muslim), and spiritual healers, including channel psychics, shamans, a Qigong master, as well as a series of fortune-tellers, psychics, and demon chasers in addition to a multitude of psychotropic medications. The demons grew larger in time—invading her dreams, convoluting her thoughts, and sucking her spirit out of her body like a vampire devouring its victim’s life force. This is why I know suicide was not her conscious choice. Rather, it was the manipulation and delusionary demand of the demons that possessed her mind and sentenced her to death. Her destiny was no longer her own. She fell into a trance reinforced by the hallucinations of her psychosis. Like the mythological Persephone (daughter of the Greek goddess Demeter), Pam, too, was abducted into the abyss, but for Pam it was forever. I hope you are enjoying the challenge so far. ‘Challengers’ please add you link to the linky on my post for the day. Do comment on my post and 2 other posts linked before yours. If you are the first person to link, then visit the previous day’s post and comment on the last 2 blogs linked there. Don’t forget to share the posts you’ve visited on social media using the hashtag #septemberchallenge. Reach out to me if you need any assistance. You might like to use our badge too, which you will find on the sidebar. If you run out of ideas, you can find plenty here Blog Hops and Writings prompts. Enjoy writing, connecting and sharing! Shocking and heart breaking. The mother and daughter both being professional pschotherapists and still couldnt do much to help goes on to prove the seriousness and graveness of mental diseases. I have added it in my TBR list. That’s the saddest part, Shilpa. Painful, yes but also full of hope! Such a tragic story. Hats off to Joan Childs for writing about this. Not sure if I could handle reading this. Though it is heartbreaking, I would love to read this book. I feel it will make me grow as a person. Thanks for sharing your thoughts. Maybe, I would not have known about such a book. I don’t necessarily enjoy these books, Shalini, but like you said I read them to expand my knowledge and build myself up. This is heartbreaking and I think I would have to read this book in stages. I can only take sadness such as this in small doses.. God Bless them both. Mental illness continues to be one the less discussed topics in our country. Most of the signs go ignored because we lack the basic knowledge of dealing with such critical and sensitive issues. I am sure for the author it must have been a challenge to talk about a personal loss and yet convey the important message. A true braveheart! Thank you for sharing this Corinne. Such a tragic situation in this book. I woudl love to read it though, as I might be able to find some healing in it. I have a mental illness myself. This is perfect testament to how writing can help a person cope with even the most awful situations. Good for her to find a constructive way to cope with her grief while at the same time offering hope and support for others living through the same kind of tragedy. This one hits home. Several years ago, one of my husband’s cousins killed himself after years of struggle with bipolar disorder. Ironically, he had (from outward appearances) seemed to have finally put his life into some kind of order. He had seemed, dare I say it, happy. And then, he was gone. For this to happen to a trained mental health professional’s daughter shows just how horrible this sickness is. I grieve for her. Really it needs a great courage to write a book and express herself when she is in a trauma of loosing her daughter. I am afraid, I cannot read this kind of book, it would depress me and i cannot come out of the characters in the book until some time, if i read. Thanks for sharing. Terribly sad this one! I can’t even begin to think that mother’s mental state. All you want to do is help, and all you feel is helpless! Yes, it’s such a truly difficult situation, Vinitha. I am so tired of the stigma attached to mental illnesses. So I am so glad that there are books like this one. A lot of the stigma has to do with fear and the fear has to do with ignorance. So the more that is done to dispel that ignorance the better. And even though dealing with a mental illness (for ourselves or in the family) can feel like a rather lonely experience sometimes, I expect we are not as ‘by ourselves’ as we feel. I honestly don’t think I could read such a book. It would break me down. But I can imagine how hard it must have been for that mother to have to watch the events unfold before her eyes and then sit back and think of all the warning signs she may have missed and should have paid more attention to. As a doc, we frequently have that moment when a patient goes bad and we sit back and think of signs and symptoms we missed that we should have paid more attention too..
What a tremendous amount of courage it takes to look at a traumatic situation from outside, knowing the pain will never fade. I am full of admiration. Let me check if the book is still available On NetGalley. Thank you for sharing, Corinne. By the way, I tagged you in my post today for a bloghop 🙂 *Ducking* I’d be honored if you took up the tag. It’s so true that mental illness does not discriminate. I’ve heard of this occurring to mental health professionals more than I’d like to…sometimes, for some people, the easiest way is out.